I am Rob Wakefield, founder and head coach of Propello. I am a level 3 cycling coach and a level 2 certified coach for Training Peaks. If you love cycling and performing amazingly at events you are in the right place. Our mission is simple - to create a friendly and supportive cycling community through social events, coaching, travel and cycling experiences. Excellence - expertise to build your confidence. Passion - having energy, fun and being committed to you. Inspiration - through the things we do that light your fire! I am Rob Wakefield. 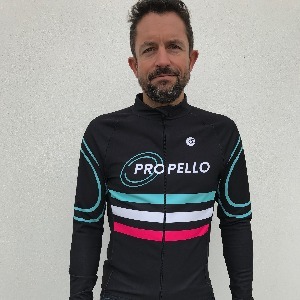 I am the founder of Propello, a Level 3 Cycling Coach with the Association of British Cycling Coaches and a Level 2 Certified Coach with Training Peaks. Following 15 years of life in the corporate world I decided that I wanted to change my life and do something that I was truly passionate about. My experience in the corporate world, holding down a demanding job with long hours and constant deadlines, and having a young family, means that I have an unusual insight for a cycling coach into the demands of balancing training, work and family life. If you love cycling, want to improve your riding, take on some amazing events, go on an adventure or race then we are the coaches for you. Success. Coach Robert Wakefield has been notified of your message. "The Saunton Sands Olympic Triathlon Training Programme by Propello and Croyde Ocean Triathlon"
To hire Robert Wakefield as your coach, select the coaching service that is right for you.